Over the years, Vicky has been commissioned to paint various images for clients. She works from life and has recently added acrylics to her repertoire of media. A painting, Carnations, commissioned by David Downton, fashion illustrator, for his journal of fashion, Pourquoi Pas? 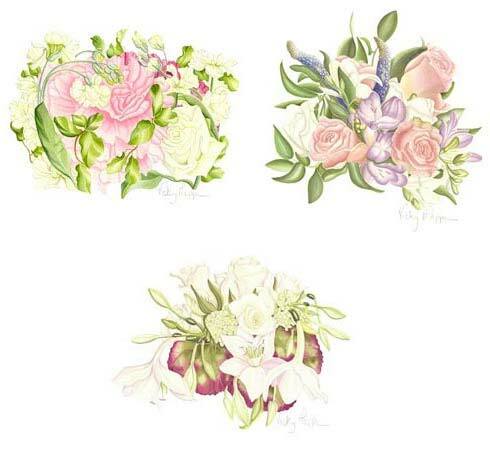 In 2006, 2010 and 2014 Vicky was commissioned by Glyndebourne Opera to paint flowers from their gardens. The paintings were exhibited during the Summer Festival and inspired card wallets which were sold in the opera house’s gift shop. Two of the images were also featured on the annual Glyndebourne mugs for 2011. Vicky’s work has also been used for menu covers and to decorate Leith’s at Glyndebourne. In 2006, Vicky painted a set of cards for Leeds Castle. Additional commissions which resulted in card wallets include The Arlington Bluebell Walk and The Sussex Prairie Garden. Historic Sussex Hotels, a privately owned group of luxury country house hotels in Sussex, commissioned paintings to decorate their dining rooms. They have also used Vicky’s work for menu covers and specially commissioned room trays. She has recently created the decoration on a woodland theme for the doors to the treatment rooms at The Spa, Ockenden Manor, Cuckfield. Vicky recently completed a mural for a private client, using acrylic paints. The images were of a bird’s nest, parrots and Bird of Paradise flowers. Vicky has painted a number of brides’ bouquets in the past. You an create a lasting memory of a very special day for the bride and groom by commissioning Vicky Mappin to paint the bride’s bouquet while the flowers are still in a reasonable condition. If it is impossible to deliver the bouquet to Vicky within a day or two of the wedding, she will reconstruct a section of it using the same fresh flowers with help from your photographs. This makes a wonderful wedding gift. More of Vicky Mappin’s work can be seen in The Art of Botanical Painting and The Botanical Palette, where she gives step by step instruction on the processes involved. Both books are written in association with the Society of Botanical Artists.